Republican presidential contender Donald Trump professed both his love (for the Bible, for veterans) and disdain (for the U.S. tax code, for the Department of Veterans Affairs) in an interview with conservative television host Sarah Palin late Friday. But while his suggestions to make America great again were par for the Trump course, the true novelty of the talk was Trump's relatively chummy relationship with his interviewer. "If you look at what's happening with this country, it's so sad. You've pointed it out for years," Trump told Palin on the conservative-leaning One America News Network. "I have to tell you - you're a terrific person." In a campaign marked by adversarial encounters with journalists -- including his booting out of Univision anchor Jorge Ramos from a press conference and his Twitter offensive against conservative darling Megyn Kelly of Fox News -- Trump's cordial chat with Palin stands out. The interview started with high praise from the former vice presidential nominee, who commended the Trump campaign for leading a true "movement." "The Trump-eters. 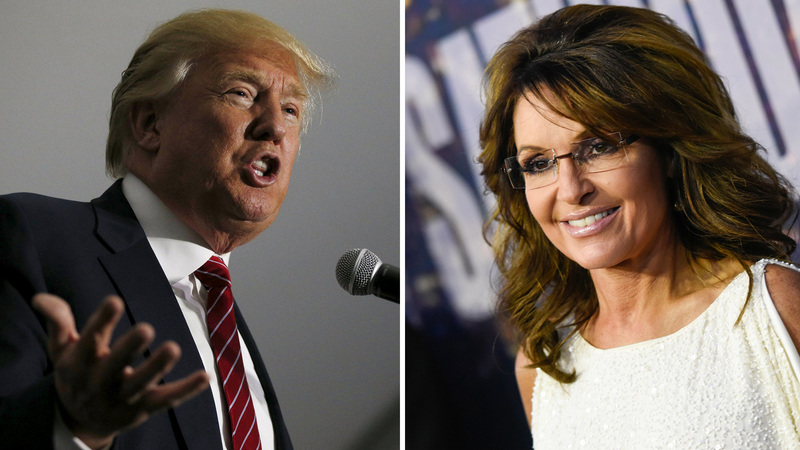 Trump-servatives, these are what these folks are called," Palin said. "Everything about Donald Trump's campaign is avant garde. He is crushing it in the polls." Trump answered questions about unemployment: "We've lost tremendous amounts of jobs to China, Japan, Mexico. It's really very sad when you look at what's happening." And taxes: "We have to simplify our tax code. You have hedge fund guys who are virtually paying no tax, and they're making a fortune." And veterans: "They did a poll recently - and I'm popular with the vets. They know I'll fix the VA. It's a disgrace. They are great people and treated very badly." Trump even doled out a compliment to Palin during the interview, applauding her work with those who had served in the military. "One of the reasons I've always liked you, Sarah, you have that great connection," Trump said. "And it's really simple: You look at what's happening with the vets." The two found common ground commiserating about journalists' "gotcha" questions for right-wing candidates. "You get hit with these 'gotchas' like we conservatives do. For example, the press asking, 'What's your favorite Bible verse?'" Palin said. "How are you finding that? Finding a technique to put them in their place so the American people don't waste their time and get to hear what's important?" "You saw that," Trump responded. "I love the Bible. I'm Protestant, I'm Presbyterian. They were hitting me with different questions. I don't know if it's a 'gotcha' - it probably is. They said, 'What's your favorite verse?' That's a personal thing. I don't like giving that out to people you hardly know." Though Palin's political star has faded since running for executive office with Sen. John McCain in 2008, other contenders for the White House have also courted her endorsement. Texas Sen. Ted Cruz and former Florida Gov. Jeb Bush both also appeared on her show Friday night.